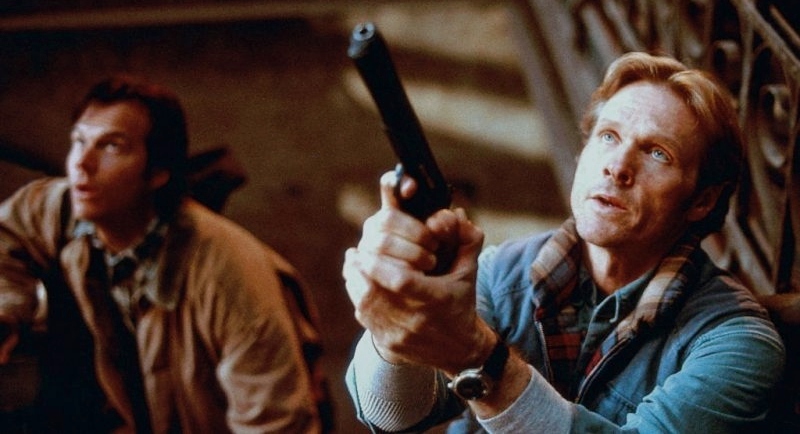 Co-written by the team of Bob Gale and Robert Zemeckis in 1977 (just before penning 1941 and Back to the Future), the forgotten but enjoyable urban thriller Trespass (1992) remains a solid example of hard-hitting action with just the right amount of cheese to make it even more entertaining. Starring the late Bill Paxton, William Sadler, and Ices T and Cube---that's twice the ice!---with outstanding direction by the reliably good Walter Hill (The Driver, The Warriors), it's the kind of movie that stops your remote while channel-flipping on a random weekend afternoon. Its plot is simple enough; think "Die Hard in...an abandoned building? ", except no one actually has noble intentions. The closest to a moral center is Vince Gillian (Bill Paxton, Frailty) who, along with fellow fireman and substantially less moral friend Don Perry (William Sadler, Bill & Ted's Bogus Journey), is looking for a fortune in gold hiding inside a derelict building in East St. Louis. 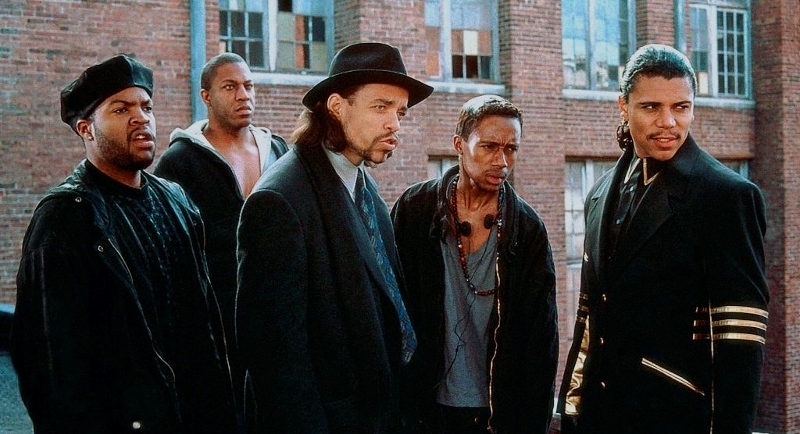 Unfortunately, Vince ends up witnessing a murder by well-dressed gang leader "King James" (Ice-T, Tank Girl) and his associates, including James' brother Lucky (De'voreaux White, Die Hard), hot-blooded Savon (Ice Cube, Friday), massive Cletus (Tommy "Tiny" Lister, The Fifth Element), gun supplier Raymond (Bruce A. Young, Basic Instinct), and a guy who just records their crimes on video for some reason. Soon enough, there's a hostage situation and a tense game of cat and mouse: one side's got untold riches with no means of escape, and another just wants their man back. It lasts for 90 minutes, and I'd gladly watch another 30. Originally titled "The Looters", Trespass underwent a last-minute name change and delayed release for the same reason (the 1992 L.A. 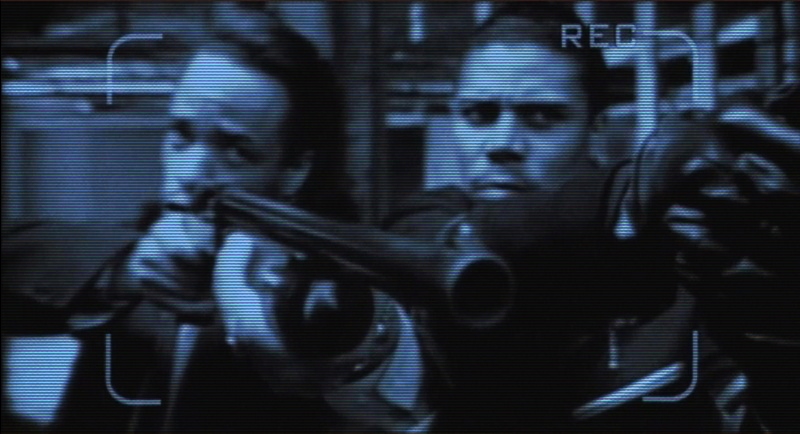 Riots), and its ending was also hastily re-written after a disastrous test screening. Neither move worked in its favor, as Trespass was unceremoniously dumped into theaters on Christmas Day (!) that year, where it tanked at the box office and was quickly forgotten about. It's a shame, too, as this well-crafted slice of early 1990s action has held up really well during the last 25 years, especially thanks to the outstanding stunt work and practical effects that are rarely done at the same level these days. If that weren't enough, Ice-T and Cube spit hot fire on the title track...even though it's not the dirty version, which would've doubled the film's profanity. Universal apparently released Trespass on DVD all the way back in 2004, but with so little fanfare that I couldn't find a Region 1 review anywhere. Having never owned said disc, I can't speak to its quality but Shout Factory's new "Select" Blu-ray is impressive from every angle: serving up a great A/V presentation and a fine assortment of new and vintage bonus features, it's a well-rounded catalog release that we could use a lot more of these days. Established fans will be thrilled with what we get here, while action-loving newcomers should consider this a solid blind buy. Presented in its original 1.85:1 aspect ratio, this 1080p transfer of Trespass looks quite good from start to finish: it has that unmistakable early 1990s appearance that seems to be preserved here perfectly. Natural grain is evident from start to finish, with no signs of excessive noise reduction or other digital eyesores (compression artifacts, edge enhancement) or encoding issues. The film's earthy color palette looks good too, while the handheld video scenes are appropriately soft by design; I'm unsure whether they were shot with actual consumer-grade equipment or simply post-processed, but they look authentic nonetheless. Image detail, especially in close-up, is very crisp with obvious textures and good shadow detail. Overall, this is a great effort that fans and first-timers will enjoy. DISCLAIMER: The promotional stills and other images on this page are decorative and do not represent the title under review. Both audio options (2.0 DTS-HD Master Audio and PCM stereo, which sounded identical during the parts I sampled) also represent a solid effort. Dialogue is clear from start to finish, while channel separation is quite noticeable at times and the score by Ry Cooder is balanced nicely without fighting for attention. But obviously the film's frequent action scenes, punctuated by plenty of gunshots and breaking glass, are the real standout here: they're especially well-mixed and punchy, making Trespass sound a few years younger than it actually is...even without the benefit of a full-fledged surround mix. Optional English subtitles have been included during the main feature only. The interface is presented in Shout's typical no-frills style with smooth, simple navigation and the bare minimum of pre-menu distractions. Separate options are provided for chapter selection, audio/subtitle setup, and bonus features. This one-disc release is packaged in a standard keepcase with poster-themed cover artwork (similar to the one below) that features a colorful inside design as well. No matching slipcover this time, unfortunately. As with most Shout Factory releases, the bulk of these extras arrive in the form of new Cast and Crew Interviews: "Fool's Gold" (12:32) features actor William Sadler, "Born Losers" (13:14) sits down with co-writer Bob Gale, "Wrongful Entry" (13:49) chats with producer Neil Canton, "Gang Violation" (6:10) features stunt coordinator Allan Graf, and "Trigger Happy" (6:27) catches up with weapons supervisor Mike Tristano. There's a great cross-section of technical insight, personal memories, and plenty of candid photos glimpsed during this series of interviews; many of them reference the story's 1977 inception, comparisons to classic Westerns like Treasure of the Sierra Madre, practical stunt work, the film's eventual name change, and the turbulent racial landscape of 1992 Los Angeles. These interviews are all slickly produced and look great, but one mild issue: the film clips have noticeably filtered audio. A handful of older goodies are also on board, and were apparently included on Universal's 2004 DVD as well. 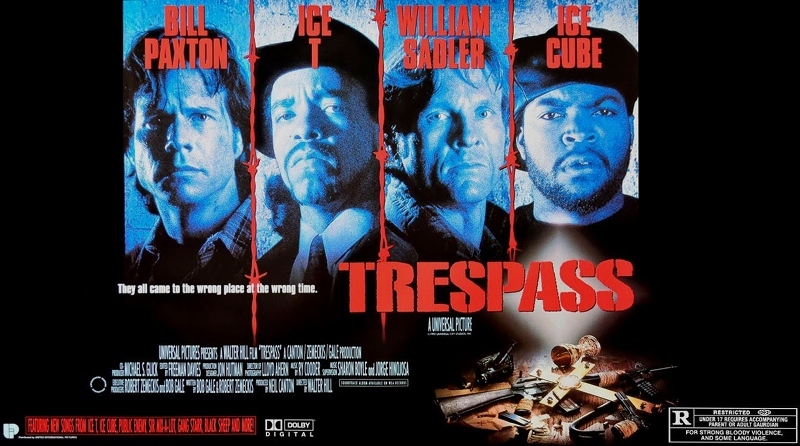 These include a Vintage Behind-the-Scenes Featurette (4:06), a handful of rough-looking Deleted Scenes presented in raw 2.00:1 format (10 clips, 4:49 total), a Music Video for "Trespass" by Ice-T & Ice Cube (3:24), and a faded 1.33:1 print of the film's Theatrical Trailer (1:59). Aside from the absence of Walter Hill and both Ices, it's a fine mix of extras; the late Bill Paxton was scheduled to sit down for an interview, but unfortunately died before it took place. Trespass is a forgotten but entirely enjoyable 1992 thriller with great casting, impressive stunt work, plenty of hard-hitting action, tight pacing, and a memorable atmosphere that all work to its advantage. It's simply a well-crafted little action movie that's aged fairly well during the last two and a half decades, especially in the wake of countless CGI-slathered blockbusters that feel so processed in direct comparison. High art this ain't, but it's still a good time at the movies and definitely holds up to multiple viewings. Shout Factor's new Collector's Edition Blu-ray easily replaces Universal's 2004 DVD with a great A/V presentation, nice packaging, and a fine assortment of quality bonus features. Without question, fans and first-timers should enjoy this one in equal measure. Highly Recommended.